As part of developing the syllabus for the Post-Graduate diploma in NGO Management, faculty from universities and colleges of Punjab, Peshawar and Sindh (Jamshoro) along with representatives from the provincial social welfare department and Community World Service Asia staff came together for a three-day consultative workshop in Lahore this August. The key objective of the workshop was to discuss and agree on the main contents of the teaching guideline for each of the modules taught under the NGO management course and develop clear action plans for the course. The interactive and discussion filled workshop facilitated by Takeshi Komino, Deputy Director and Disaster Risk Reduction (DRR) Expert, Community World Service Asia, had a participation of twenty academia practitioners, fifteen women and five men. These included University Professors, Assistant Professors, Lecturers and college teachers, from across Pakistan. To support universities in teaching about humanitarian and development practices (based on field work) and empower them on tools and approaches used by development professionals, Community World Service Asia succeeded in developing partnership with two Universities i.e., University of Peshawar and University of the Punjab. Both of these universities are among the oldest institutions in Pakistan. In both the universities, the Department of Social Work has been assessed to being very similar to the work of the aid and development sector. 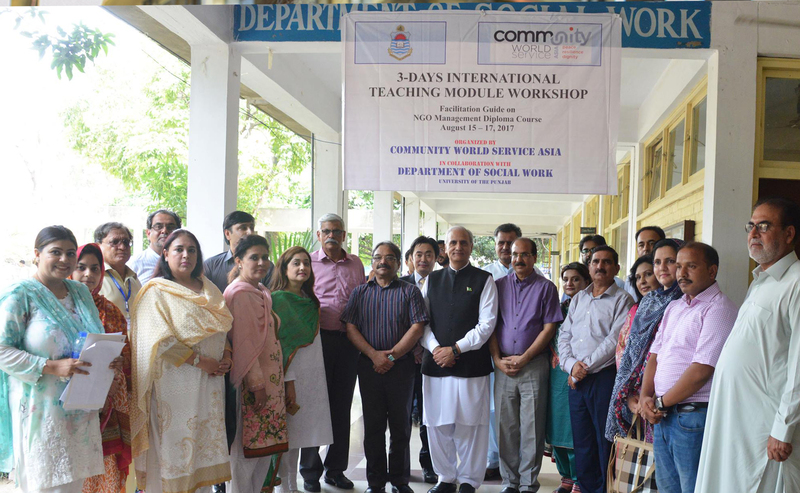 Community World Service Asia then initiated the process of supporting both institutions in designing this new post-graduate diploma course through a six step process leading to the launch of the degree. Peshawar University already launched the degree in February this year and received an overwhelming application response from graduate students and some NGO practitioners. While, University of Punjab aims to start offering the course in December this year and University of Sindh plans to initiate it sometime in their 2018 semesters. This workshop is part of the technical and consultative support that Community World Service Asia is providing to the academia in assuring that the degree fully meets its objective of familiarizing students with the fundamental concepts of NGO management and its project implementations, its role in bringing about social change through explaining the various dimensions in which it works. The next step in this process is to conduct a Training of Trainers on “Creative Facilitation Skills” to further strengthen the capacity of faculty members teaching the various course modules. This is planned to be held in Peshawar University this October. “This course is really a need of the hour as far as the significance of this degree is concerned, considering the situation in Pakistan. We are a developing country; we cannot always rely on the government alone. Therefore, we have to support and encourage NGOs and the university and academia needs to take a step ahead. We must add specific development and aid practice related programs to our departments and courses. These will help future practitioners and those who are already in the field. It will also help those who want to establish NGOs to serve the people of the country. This three-day workshop really helped in building the right curriculum for the NGO management course. We are expecting that the drafted curriculum will be further refined. We at Punjab University really intend to start the degree within 6 months. I am sure we will be getting a great response from the students. Bashir Khan, Deputy Director, Social Welfare Department (KPK) & Visiting Faculty at Peshawar University. Farhana Noreen, Human Rights Teacher, Social Sciences Department, Peshawar University. “I am teaching the Human Rights modules to students in this degree. We received more applications from new under-grad students for this diploma course. Therefore, we have started the modules and subjects from the very basic level. The teachers for this course have been given 30% flexibility on teaching methodologies which is great. Students are very enthusiastic to learn as they are eager to join the NGO sector. As part of the course, we organised exposure visits of students to the Ministry of Human Rights as practical learning. This aspect of learning has been very effective and of great interest to students. Waheed Akbar, Lecturer, Social Work Department, University of Sindh in Jamshoro. “As far as my department and our university is concerned, this is a very helpful course for the future of our students, given that they will get this sort of professional knowledge through all the modules included in this one-year diploma. I think this will be a milestone in our department and as well as for students of social work in this area. During this course and after completion, students will be equipped with specialized knowledge and skills and their capacities will be enhanced. Our university will be creating resources for the development and humanitarian sector of our province. The NGO management diploma is also offered to professionals who are already working in the field, though many of them don’t have the exact NGO academic qualification. Therefore, this will be an added platform and capacity building opportunity in the form of a certified degree for them.